Despite the chatter around flattening smartphone sales, sales of devices aren’t headed for a “perpetual decline,” according to a note from UBS. Smartphone sales are expected to decline 5% this year because of a perceived lack of innovation around new features and because users are holding onto their devices longer. But UBS analyst David Mulholland predicts sales in 2020 will ultimately stabilize or even rebound slightly, increasing by 1%. That’s because manufacturers cap the lifetimes of devices by cutting off operating system software upgrades for older devices. But more importantly, newer technologies such as 5G, which enable faster, more reliable internet connections, and foldable displays are expected to generate more interest in device upgrades. “We do not believe that the industry is heading for perpetual declines as the PC industry did as we believe lifetimes will be capped and that new features such as foldable displays and 5G can stimulate demand to +1% in 2020E,” Mulholland wrote in a report published in mid-February. As a result of flattening sales, companies are getting more creative with form factors, including foldable displays. Samsung, for instance, unveiled its first smartphone with a foldable display, the Galaxy Fold, at a company event in San Francisco on Wednesday. The device, which sports a new 7.3-inch “Infinity Flex Display,” arrives on April 26 and starts at $1,980. Motorola, meanwhile, plans on reviving the iconic Razr phone, which sold 130 million units in its heydey, by releasing an all-new design later this year with a foldable display that will reportedly retail for $1,500. As for 5G? Expect the first wave of devices to hit the market later this year. Announced on Wednesday, Samsung’s 5G-enabled Galaxy S10, launches this spring on Yahoo Finance’s parent company Verizon (VZ) followed by AT&T (T), Sprint (S), Spectrum Wireless, T-Mobile (TMUS), and Xfinity Mobile (CMCSA) in the summer. Both foldable displays and 5G are expected to generate more excited than features released in more recent years. Take Face ID, which Apple (AAPL) debuted to consumers with the iPhone X in November 2017. 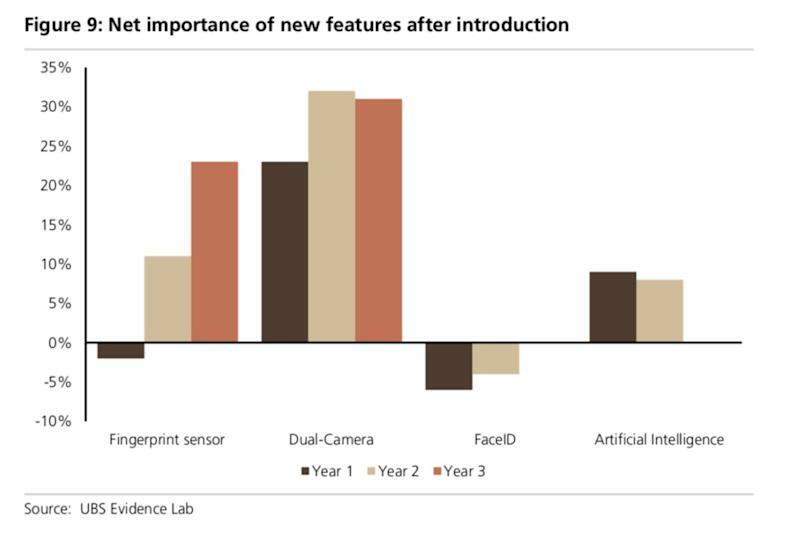 According to an online survey conducted by UBS’s Evidence Lab, smartphone users polled found that the facial recognition feature, used to unlock phones and make some transactions, was significantly less important than Touch ID, the fingerprint sensor feature Apple introduced with the iPhone 5S back in 2013. Users were also much more jazzed about dual cameras, rolled out in the iPhone 7 Plus in 2016, than more recent, less tangible features like artificial intelligence, which is being used to improve everything from the effectiveness of voice assistants to photo quality. A comparison of smartphone users' interest in features including Touch ID, dual cameras, and artificial intelligence. The UBS Evidence Lab surveyed 6,891 smartphone users in April 2018 across the U.S., UK, Germany, China, and Japan. That survey uncovered some possible explanations for the current weakness in the smartphone market. Indeed, smartphone users in countries including the U.S., UK, and China are holding onto their devices between two and three months longer now than they were four years ago, according to research conducted by the investment bank in 2018. Also worth noting: Japanese users hold onto their devices significantly longer (around 3 years) versus those in the U.S., who hold onto their devices just over 2 years on average. Despite these weaknesses, smartphones are inherently different from PCs, given their form factor and a faster upgrade cycle. But whether smartphone users are enticed enough by foldable screens and 5G to upgrade for new devices some time next year all depends on whether manufacturers deliver — and effectively market — the goods.